← Harp ace Bob Corritore & friends blow through the crossroads with Don’t Let the Devil Ride! Nearly 30 years after playing together with their father, harmonica ace Carey Bell, on the 1990 Dynasty! 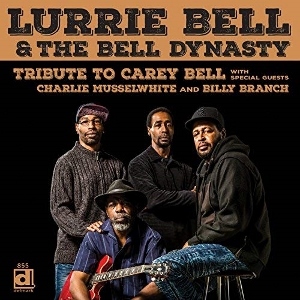 album, brothers Lurrie, James, Steve, and Tyson Bell are continuing to carry on their dad’s legacy as Lurrie Bell & The Bell Dynasty. Although the Dynasty is but a part-time gig for the brothers, with Lurrie (vocals and guitar) having a successful solo career in addition to being a co-founder (along with harmonica player Billy Branch) of The Sons of Blues, Steve (harmonica) being a current member of blues singer/guitarist John Primer’s band, and Tyson (bass) having recently worked with another true son of the blues in Magic Slim (Morris Holt) offspring Shawn Holt, you’d swear from the tightness of the siblings’ latest recording that these guys have been playing together, well, all of their lives. Appropriately available on the same Delmark Records label as on which Carey released his debut album (Carey Bell’s Blues Harp) almost 50 years ago and two collaborations with Lurrie in the 1977 Heartaches and Pain (Lurrie’s debut recording) and 2007’s Gettin’ Up, released just weeks before Carey died at age 70, Tribute to Carey Bell features a dozen tracks honoring their father. This includes the band’s take on a number of originals and classics performed by Carey throughout his career, as well as a pair of originals from the band in James’ dragging “Keep Your Eyes on the Prize” — one of three tunes on which James (who also plays drums on the project) handles vocals, along with “What My Momma Told Me” (Junior Wells) and the funky “Break It Up” (Little Walter) — and a shuffling, Billy Branch-penned “Carey Bell Was a Friend of Mine” that features Branch on vocals and trading some nice licks with Steve on harmonica. Branch is also on the mic for the band’s soft, creeping cover of Carey’s “So Hard to Leave You Alone”, with Branch’s longtime pianist Sumito “Ariyo” Ariyoshi also accompanying on both tracks as well as on the closing “When I Get Drunk” (Eddie “Cleanhead” Vinson). 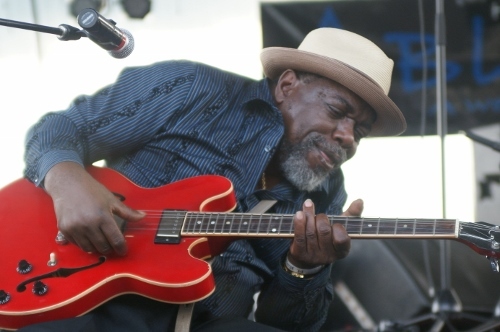 Eddie Taylor Jr., whose father played with Carey throughout his career, including on his Blues Harp debut, joins on guitar for much of the session, while Charlie Musselwhite provides some additional harp power on the bouncy “I Got to Go” (Little Walter). That said, Steve provides some mighty impressive harpwork of his own throughout the album (using the same harmonica microphone inscribed with his father’s name that Carey used during the recording of Gettin’ Up), catching the ear from the very start on Muddy Waters’ “Gone to Main Street” and Big Walter Horton’s “Hard Hearted Woman”, one of the album’s most delightful tracks along with such other gems as the slow, hard blues of Carey’s “Woman in Trouble”, and aforementioned “When I Get Drunk” (each of the above sung by Lurrie), “What My Momma Told Me” (sung by James) and “Carey Bell Was a Friend of Mine” (Branch). Together, it’s a fitting and terrific tribute to this long-departed blues player, with Lurrie’s guitar and vocals and Steve’s harmonica all helping to add some nice grittiness to their father’s numbers. Whether you’re already familiar with Carey’s work or The Bell Dynasty’s takes here are your introduction, this is one you’re surely going to enjoy! This entry was posted in Albums and tagged Billy Branch, Carey Bell, Charlie Musselwhite, Eddie Taylor Jr., James Bell, Lurrie Bell, Steve Bell, The Bell Dynasty, Tyson Bell. Bookmark the permalink.